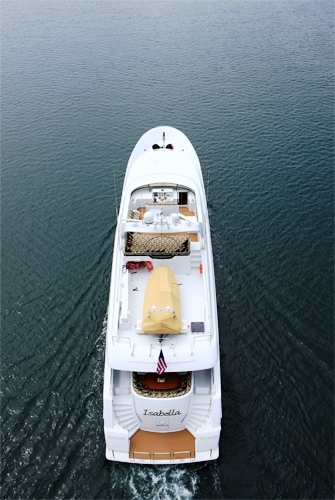 Luxury Motor yacht Isabella is a 35m (118ft) Westport yacht built in 1999. This elegant and luxurious yacht with a full 25' beam yacht and offers accommodation for 8 guests in her 5 staterooms plus crew quarters. The elegant and sophisticated interior of the Isabella was designed and built by Pacific Custom Interiors with uncompromising craftmanship. Her spacious Main Saloon has a beautifully tailored L-shaped couch and 2 matching barrel chairs that provide easy access to the full entertainment amoire separating the dining and living areas of the salon. The large entertainment armoire has a 40" TV/DVD/VCR and FM-AM Stereo. Rounded corners and uncluttered surfaces provide an airy feeling to the salon, dimmer switches located in select locations create appropriate ambient lighting for a variety of functions and high quality carpet installed with a sound barrier to protect guests occupying rooms below the main deck a just a few of the thoughtful details evident throughout Isabella’s interior. The main Saloon also has sitting game table with 2 high back chairs. 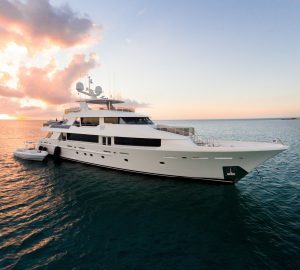 To starboard, nestled near the automatic doors with easy access to the aft deck is a full service granite topped bar with comfortable seating for 4. The drop counter allows for unobstructed views enhancing the blending inside and out. The formal dinning room has a stylish inlayed burl table with matching burl chairs with leather seat cushions. 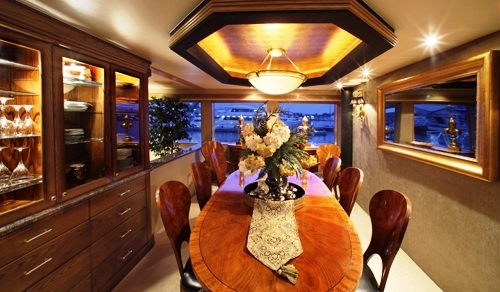 Overhead is a custom designed chandelier in a gold leafed octagon inset. Two matching buffets complement the traditional style of this room. Located in the forward portion of the main salon, oversized windows allow for stunning views. 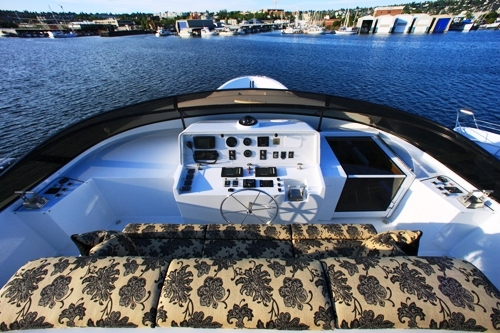 Isabella’s Pilot house has been designed for maximum visibility, control and comfort. 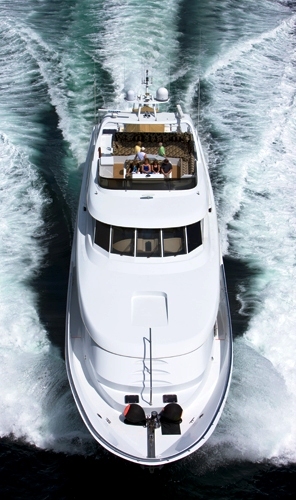 Aft in the pilothouse is an 8-seat settee with twin tables, which may be used as a casual dining, sightseeing and lounging. Outside el fresco dinning is possible on the aft deck which has settee and chairs for 8 guests. 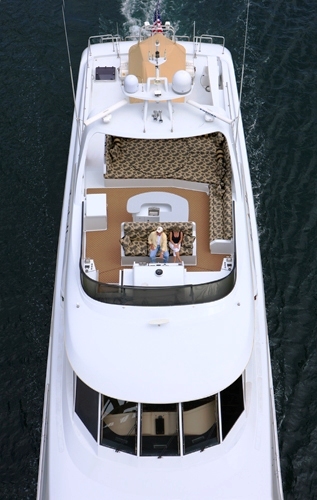 Access to the swim platform is also possible from the aft deck. 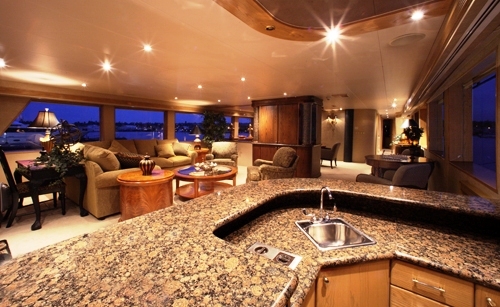 The sundeck has a Full bar with sink, fridge & bar stool seating for 4. There is cleaver use of space with a Spa Pool that can also convert to a giant sun pad. Sun pads also completely surround Spa Pool therefore allowing ample sunning areas. There is also a Helmstation (pictured below) and access to Aft Deck via ladder. The Tender & waverunner is stored aft of the sundeck. Once toys are launched, there are removable chocks for lounge chairs (TBD). 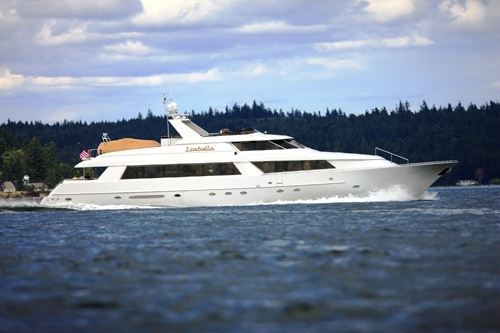 Luxury charter yacht ISABELLA can accommodate a maximum of 8 guests. 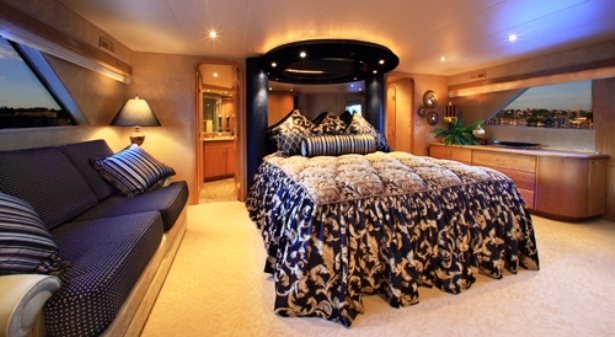 The Master stateroom with King bed is located all the way forward on the main deck and boasts a 3-seat settee. 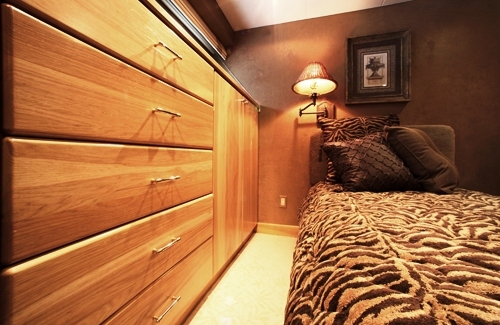 The En-suite has double sinks and heads along with a with Spa Pool tub and separate double headed shower. Entertainment center features include a flat screen TV/DVD/VCR/CD AM-FM Stereo. 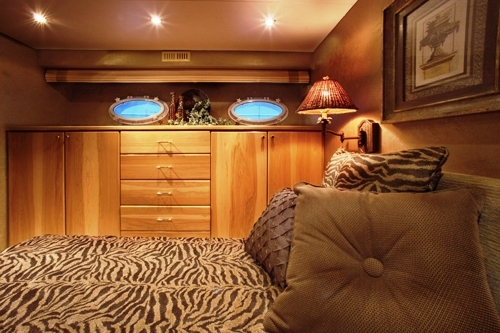 This stateroom also has a walk-in cedar lined closet designed to maximize all available space. Built with safety in mind, there is direct access to the pilothouse in the event of an emergency. The master stateroom is an elegant retreat with a warm feel. 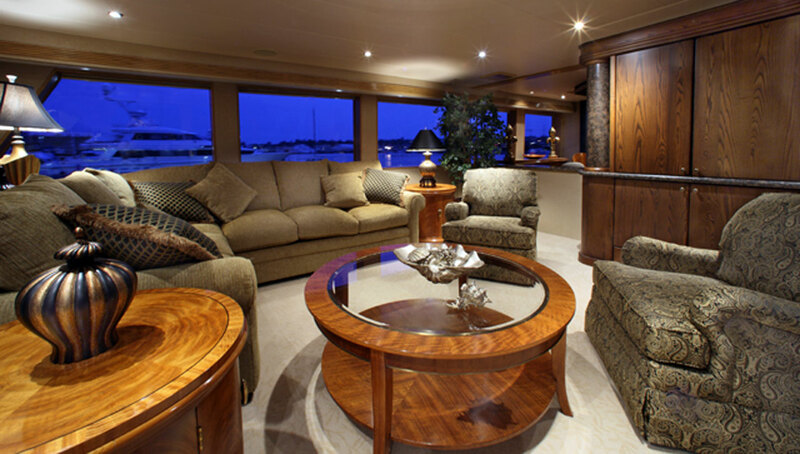 The elegant and sophisticated interior of the yacht was designed and built by Pacific Custom interiors with uncompromising craftsmanship. 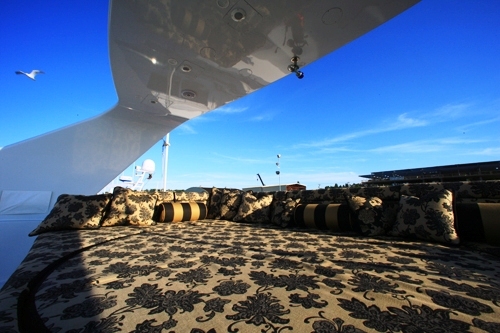 Guests will enjoy a panoramic views through the over-sized windows on either side of the main deck salon. For privacy Duette pocket blinds housed in Roman shade valances may be lowered.Seating areas have been arranged around strategically located wood and glass coffee tables. Tailored-shaped couches and matching barrel chairs provide easy access to the full entertainment center separating the dining and living areas of the salon. All other guest accommodations are below Amiship accessed through the staircase amidships to the lower foyer. Her elegant VIP stateroom located forward has a King bed. The En-suite has a spacious head with shower, toilet, sink and vanity are ensuite. This VIP stateroom also boasts a 20” flat screen TV/DVD/CD/AM/FM Stereo. Direct access to the main fore deck is provided in the event of an emergency. 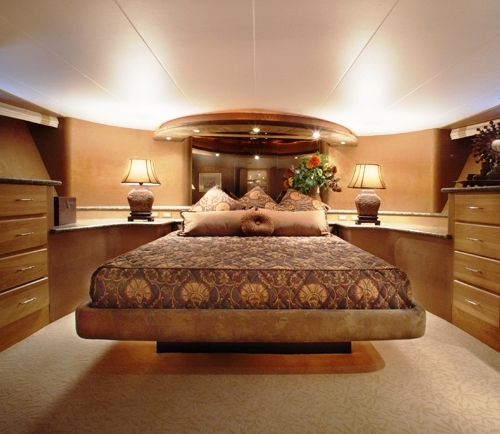 On the port Aft is a double cabin with Double bed and Ensuite with a large bath with shower. This cabin has a 14” regular TV w/VCR. The queen stateroom situated Forward to Port has a Queen bed, En-suite with large bath with shower. This room has a 12" flat screen TV/DVD/CD/AM/FM Stereo. The final stateroom is located forward to Starboard. This room offers Twin beds and has an Ensuite large bath with shower. She also has a 14” regular TV with VCR. 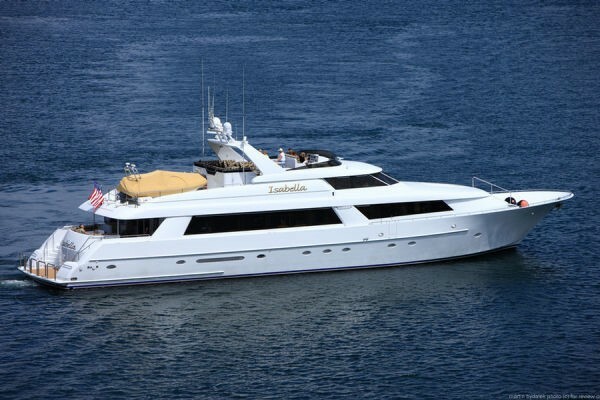 Please note that although ISABELLA is a 5 stateroom yacht she can only accommodate 8 guests. 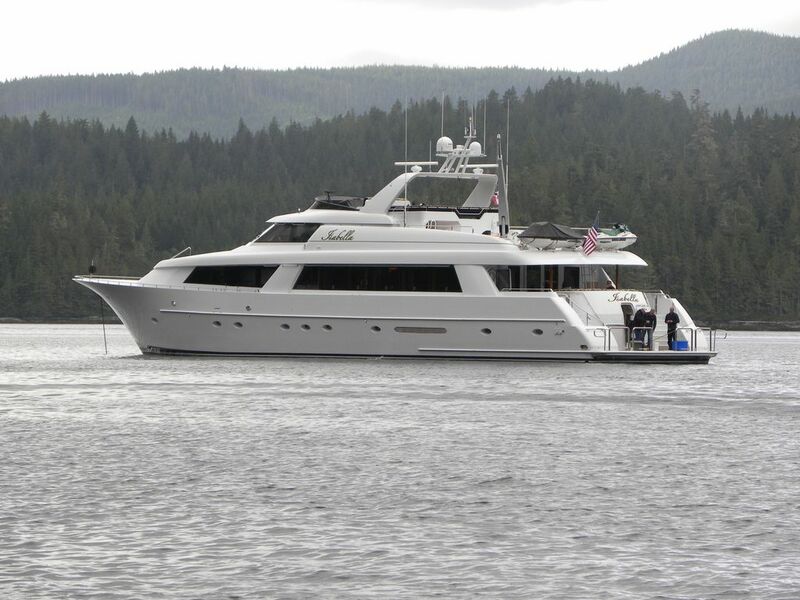 ISABELLA is equipped with a huge range of Tenders & Toys including a 19' Novurania tender with 115 hp Yamaha Outboard Motor, two 2 person SeaDoo Wave Runners, a "Monster" Round InnerTube, a Floating Trampoline, 2 Kayaks, 2 pairs of water skis, 8 Sets of Snorkel Gear, Bridge Deck Spa Pool, BBQ, Board Games, Audio-Visual Library, Beach toys, Please note that Scuba Diving is RENDEZVOUS ONLY. Her Communications include a Cellular phone, Sat phone, Sat fax, Broadband 250 internet.